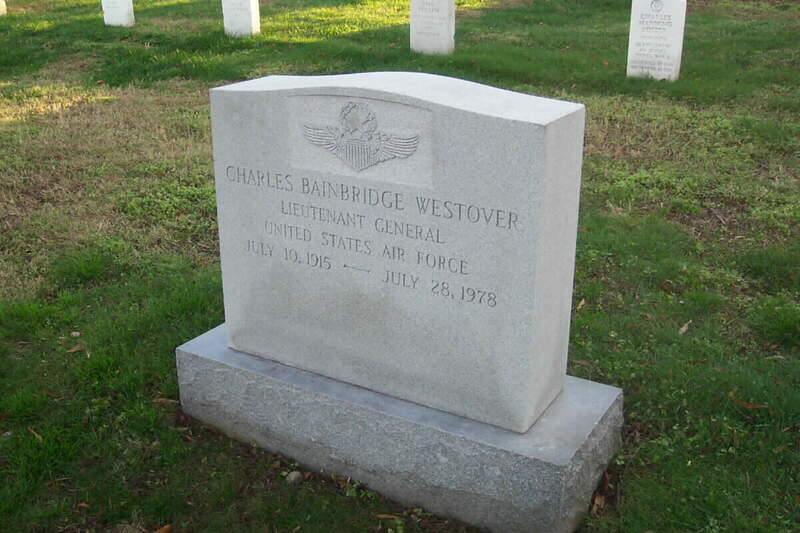 Lieutenant General Charles Bainbridge Westover was vice commander of the U.S. Air Force Air Defense Command, Ent Air Force Base, Colorado. ADC organizes, trains, equips and provides forces for defense of the North American continent against aerospace attack. General Westover was born at Fort Gibbon, Tanana, Alaska, in 1915. He graduated from high school at Leavenworth, Kansas, in 1932; the U.S. Military Academy in June 1937; and the Army Air Corps Flying Training School at Kelly Field, Texas, in October 1938. His first assignment was with the 19th Bomb Group at March Field, California, and it was as a member of this unit that he took part in a pioneering mass flight of bombers to Hawaii from California in 1941. He was reassigned in June 1941 to Headquarters Air Force Combat Command, Bolling Field, Washington, D.C., and in August 1941 to the 3d Bomb Wing which soon became the 3d Bomb Command, MacDill Field, Fla. For the next three months, he participated in both the Louisiana and Carolina maneuvers as an operations officer of a provisional Army Air Support Command. In March 1942, he became aide to the commanding general, First Air Force and Eastern Air Defense Command, Mitchel Field, N.Y. During the period June 1942 to December 1942, he served as executive officer of a special U.S. air mission in the Union of Soviet Socialist Republics. Shortly after his return to the United States, he was transferred to the Second Air Force, Fort George Wright, Wash., and was subsequently assigned to command the 34th Bomb Group, Blythe Army Air Field, California. In June 1943, he was responsible for organizing and moving the 396th Bombardment Group to Moses Lake, Washington, serving as its commander until the following September when he was reassigned to the Eighth Air Force in England. There he served first as chief of staff of the Second Bomb Division and then as commander of the 448th Bomb Group. In July 1945, he returned to Washington, D.C., where he served for two years with the Operations Division of the War Department General Staff and for one year with the Office of the Secretary of the Air Force. He graduated from the Air War College, Maxwell Air Force Base, Alabama, in June 1949, and was then assigned to Headquarters Strategic Air Command where he served as chief of the Programs Division in the Directorate of Plans until September 1952. His next move took him to the Far East Air Forces as commander of the 98th Bomb Wing, Yokota, Japan. Upon his return to the United States in July 1953, he was named commander of the 12th Air Division, March Air Force Base, California. He remained there until March 1956, when he was reassigned to Dyess Air Force Base, Texas, as commander of the newly organized 819th Air Division. 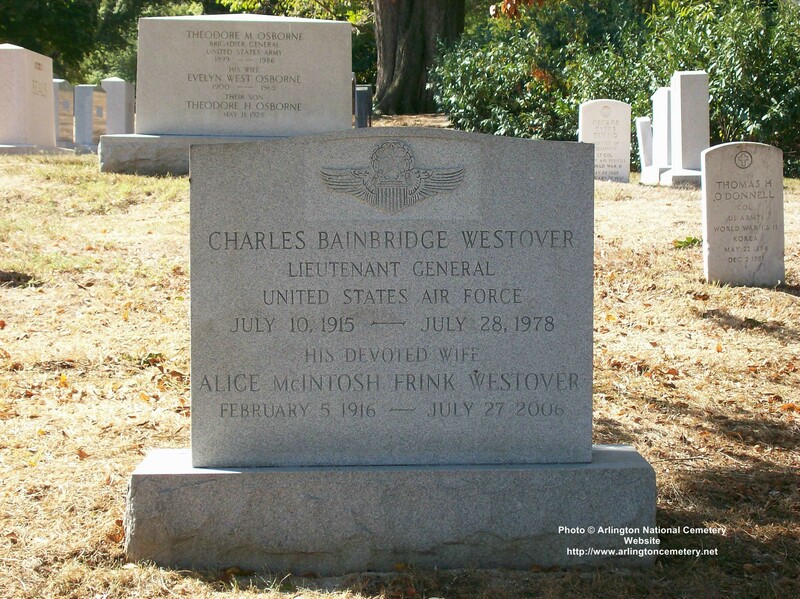 General Westover served as director of plans at Headquarters SAC from October 1957 until January 1960, when he was named commander of the 7th Air Division in England. Returning to the United States in August 1961, he was assigned as assistant deputy chief of staff, operations, at Headquarters U.S. Air Force, Washington, D.C. He served in that position until August 1962 when he was transferred to Headquarters Tactical Air Command. He was named vice commander of TAC on November 1, 1962. General Westover assumed his last post of vice commander, ADC, in August 1965. His decorations include the Distinguished Service Medal, Legion of Merit with two oak leaf clusters, Distinguished Flying Cross with oak leaf cluster, Bronze Star Medal, Air Medal with four oak leaf clusters, Croix de Guerre with Palm (France) and the Most Excellent Order of the British Empire. He is a command pilot and is credited with 300 combat flying hours on 42 combat missions. 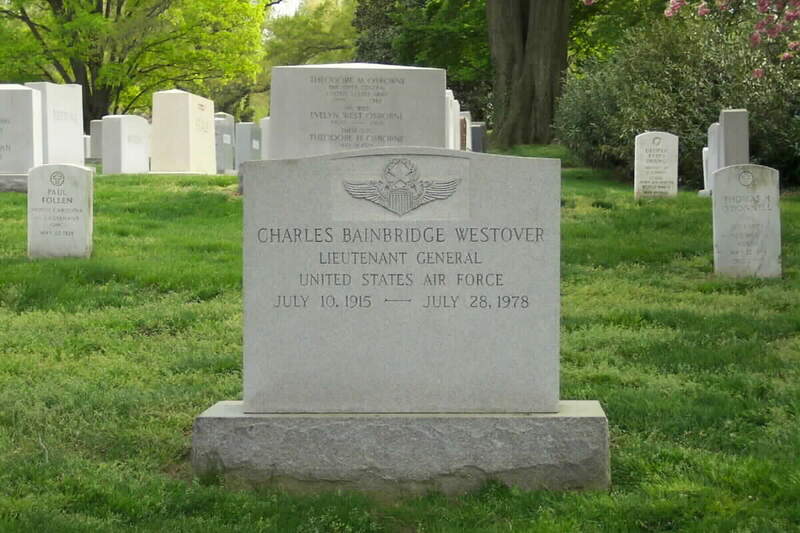 NOTE: His father, Oscar Westover, Major General, United States Army Air Corps, is also buried in Arlington National Cemetery.